The Daily Struggles of the Domestic Un-Goddess: Stuff it. On those days of the year when there is nothing I'd rather than literally stay stuffed in my bed all day....it seems only natural that my food should emulate my fantasies. I seriously can't believe how freaking cold it is...my nose froze SHUT this morning while waiting for the bus (which, thankfully, actually did show up; score one for OC Transpo). Anyway, tomorrow we're on to colder and more asphyxia-inducing lows (yay for -28C tonight....seriously!). I needed something hot and stuffed. Since turkey wasn't exactly a realistic weeknight undertaking, I knew I had to resort to other, perhaps healthier fare. Stuffed peppers. 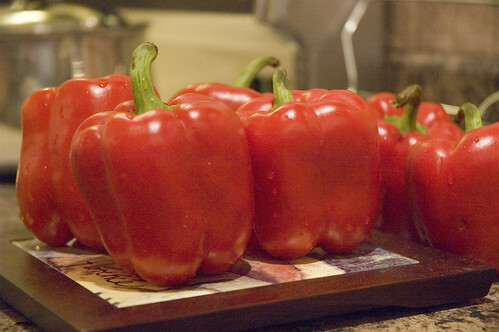 Sweet peppers are one of the most beautiful veggies out there.....such brilliant colour, great taste.....the only caveat seems to be that mid-winter, they cost more than a lot of meats do. But such is the price to pay for vitamins, health, long life and all that jazz. So I paid (but only in one colour.....has anyone yet been able to figure out how my grocery store can sell 4 kinds of sweet peppers at four different price points? does this actually make sense to someone?). 1. Set a medium pot full of water to boil on the stove. Meanwhile, core the peppers and cut in half, removing the white from the insides. Arrange cut side up on a baking sheet (again, I LOVE my silpat!). (Whenever your water gets to boiling, cook the orzo to your desired doneness and then drain/rinse). 2. In a large skillet, sauté the onion and garlic in olive oil until they start to smell fragrant. Add the zucchini and cook until softened (you could also add mushrooms, but I was both lazy and impatient). 3. Add the veggie ground ground and stir to break it up. At this point, add in your orzo, the pasta sauce and the fresh basil, and stir until well-combined. c) knock over half your peppers and cause even MORE filling to go across the floor....also like I did. 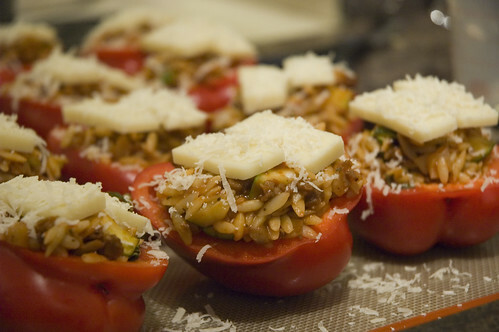 5) Top the filled peppers with some slices of mozzarella, and some grated parmesan. I like to be rather messy in grating the parmesan, because a secret indulgence of mine is the browned crispy parmesan that sits on my silpat when the peppers come out of the oven. Better than chips! But uh.....don't tell hubs. ;) I just bought another $10 slab of parm today! EEEk! 6)Bake the peppers for 25-30 minutes. Try not to overbake too much, because at a certain point, the peppers that you didn't already upend will lose their structural integrity and will send the last vestiges of filling cascading gently across the silpat (and hence ruining your browned parmesan). Cheery today, aren't I? :) Thank you so much for reading - I love getting your comments and emails!!!!!!!!! 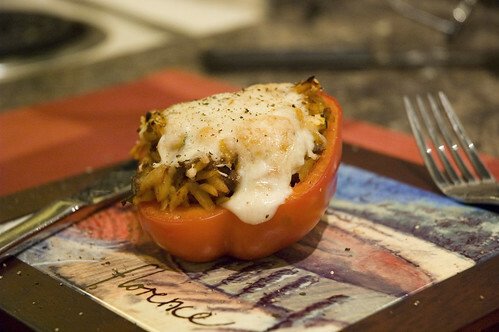 Mmmm that looks terrific, I love stuffed peppers. I think I will definately make this one. Ahh Leslie, your blog makes me miss cooking so much! It's hard to cook big fiesta-type meals with a three month old, plus i've had to cut out peppers and other 'gassy' veggies due to breastfeeding. Keep posting so I can cook vicariously through you! Since you said you love comments i thought i'd leave one this time. I lurk on your blog alll the time for yummy meal ideas (red pepper boccoccini bite things were a hit last time i had guests over, thanks for the idea!)... I also like anytime you mention where to get something yummy cause i live in ottawa west too! so.. keep blogging!! pleease! lor - I imagine I'll probably have the gassiest baby ever when the time comes....I'm not sure I could cook without gassy stuff! Good on ya! kattyb - always glad to be of help. :) Thanks!